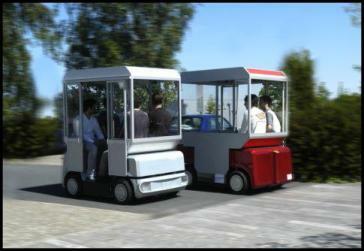 RobuCAB is an automated people-moving four-seater developed by a French company. This autonomous vehicle follows the curb to take you around. RobuCAB makes use of its embedded systems, including a camera to track the curb, and sensors to track distance to the curb, as well as gearing and acceleration. The RobuCAB also can make use of predefined circuits embedded in the pavement. "Robots have no wives," the driver said. "They are nonsexual. Robots have no friends, either. They are incapable of emotional relationships." Thought you were going to get away from all that driver-drama? Nope.